The first class on Monday afternoon brought 25 French-speaking foreign military officers from different countries together in a classroom. The class started with the students greeting their teacher at the Chinese military academy. 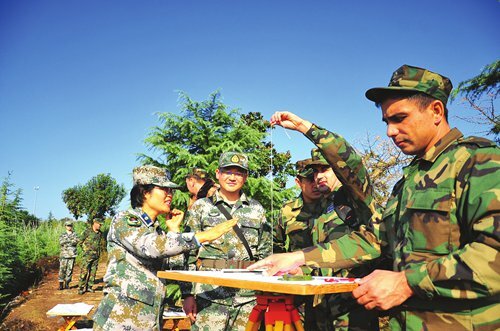 A bilingual slide presentation flashed on the screen, and student officers carefully circled the counter-attack zone on the map using their hands under the guidance of the Chinese instructor and the translator. They are among 146 overseas military officers from 77 countries who are currently studying military tactics at the International Military Education Exchange Center (IMEEC) of Army Command College in Nanjing, capital of East China's Jiangsu Province. 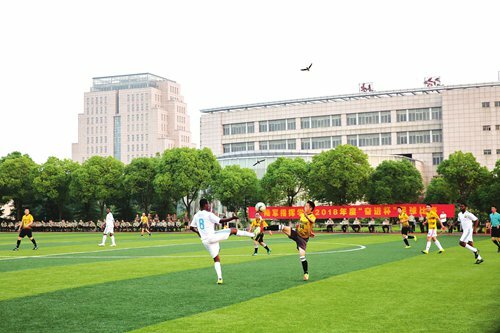 The college, with a history of 81 years, ranks among the most esteemed military academies in China. It is among the first group of military academies to undertake the mission of providing long-term military training courses for foreign officers since 1957. It has trained nearly 4,000 middle and senior command officers and government officials from 118 countries and five continents over the past few decades. The hall of the exchange center is filled with the national flags of more than 100 countries, giving it the appearance of a mini-UN. Many students view the center as an international name, comparable to West Point in the US, and it has become the top choice for many countries to send officers and commanders for training and exchange. The Chinese People's Liberation Army sets the training scheme with the purpose of deepening trust and strengthening military contacts with countries friendly to China. It also aims to spread Chinese culture and military thought. The center offers four course packages for officers at different levels: brigade commander, battalion commander, junior-level staff officer and senior staff commander. Courses are typically delivered in four languages: French, Spanish, Russian and English. The semester ranges in length from half a year to one year, while some eligible trainees can apply for a two-year master's degree from the college. Theoretical courses focus mainly on counter-terrorism training, coordinated tactics, battlefield intelligence collection, and the operational system of the Chinese military. Chinese language courses are also provided for better learning and understanding. Most textbooks are bilingual, and some of them have been translated into French, Russian, Lao and Spanish. Field trips are frequent to give officers the chance to get a close view of the Chinese navy and air force's operations. They have had opportunities to board Chinese warships and climb into the cockpit of new fighter jets. They are able to learn about conducting battle command and deploying logistics relying solely on modern information technology. "Some officers from landlocked countries have little contact with the navy. They look excited when they board a Chinese ship," Zhu Lan, a junior team leader of the foreign cadets, told the Global Times. 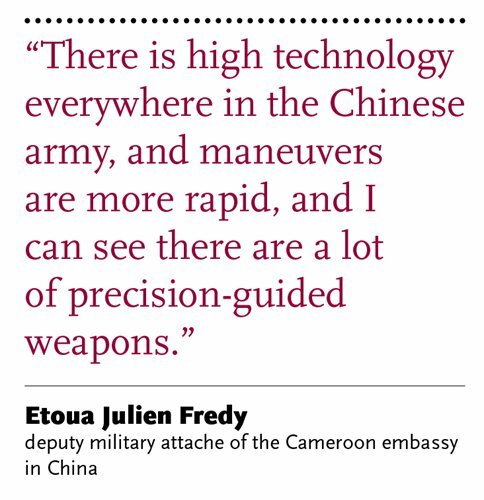 "There is high technology everywhere in the Chinese army, and maneuvers are more rapid, and I can see there are a lot of precision-guided weapons," Etoua Julien Fredy, deputy military attache of the Cameroon embassy in China, told the Global Times. "The training here makes me realize the need to update our system and doctrine. We are in 2018, but we are actually using a standard from 2000. I've seen the new way they are teaching, training and using technology in the field," he said. Anjan Keshar Khatri, a senior faculty member of the military academy from Nepal, told the Global Times, "I am from a very small country, and my country does not have a navy, air force, or even tanks. So here I came to learn about tactics and military knowledge from a big country." Officers can graduate through several rounds of assessment, including theoretical papers and practical operations. Classroom performance and attendance, and even the degree of dedication to class activities are also part of the final grade. Most of the officers attending the training are from countries friendly to China, and the list has in recent years expanded to include countries like South Korea, Singapore, Brazil, Chile and other Latin American countries. Middle Eastern countries, including Saudi Arabia and Yemen, have also seen a rise in military visits in recent years. Adnan Anwar Khan, a commander from Pakistan, said he valued the opportunity to study in China. "The competition is very fierce. I was initially selected for Spain, but I had a totally different opinion about where I would be going. Coming here I think is very different," he said. 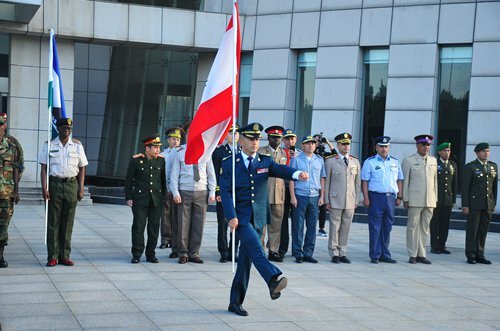 Major Min Woo Choi, a military officer from the South Korea earning a two-year master's degree in Nanjing, said that he feels honored and grateful to come to China for study and exchange. "The Chinese and Korean militaries have increased exchanges in recent years. After training, I hope I can play a role as a bridge between China and South Korea," he said. Ousman Bah is the first officer sent by the Gambian government to Nanjing for training. "I am so glad to be in the first group of Gambian officers coming to Nanjing. It is a source of pride for me, and I can beat my chest to say that I am a graduate of Army Command College in Nanjing," he said. He feels that China's army is becoming open and transparent and it has never "treated foreign students like a threat." In the hall of the exchange center, a wall is adorned with the Chinese character for "peace" written in different calligraphic styles. Hundreds of foreign cadets stopped by to ponder why the hall, where military thought and battle tactics are taught, carries the message of "peace." Many have found the answer in Sun Tzu's The Art of War, a Chinese classic on strategy written about 2,500 years ago. Major Milan Thapa from Nepal believes that the core of The Art of War is to "stop the war" by "understanding the war." In his view, the course content in the Chinese military academy falls under the principle of "defense-oriented tactics." 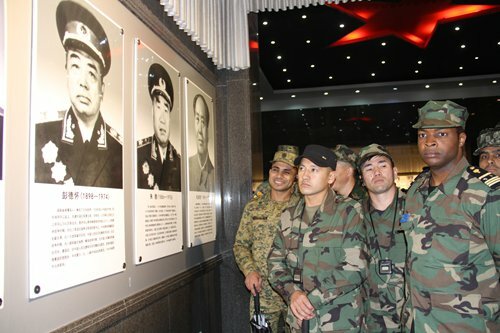 In addition to The Art of War, officers and soldiers attending the training have also shown a greater interest in the thought of Chinese leaders on army building. Visiting students attend a flag-hoisting ceremony to commemorate the national days of their respective countries. They also celebrate birthdays together every month. Athikarn Kongwattanasin, a company commander from Thailand, said that the ceremony made him feel respected, and that it brings people a sense of warmth and equality, regardless of the size of their countries. 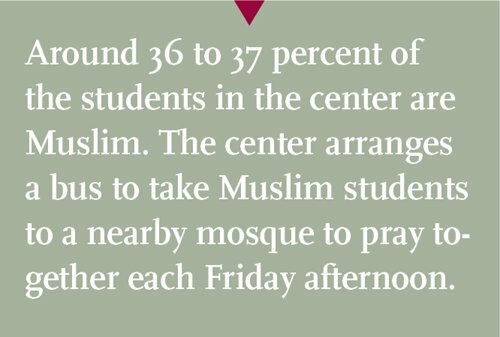 Around 36 to 37 percent of the students in the center are Muslim. The center arranges a bus to take Muslim students to a nearby mosque to pray together each Friday afternoon. "We have a special halal canteen for Muslim students, while others can choose the other canteen for ordinary Western food," Fang Xudong, a senior leader of the foreign training team, told the Global Times. Considering the customs of the officers' Muslim wives, the center provides special gym hours only for women and children from 1 to 3 pm every day. Organizing a large group of military officers from different countries with distinctive religious customs is never an easy task. Changes in diplomatic relations inevitably bring contradictions and even conflict. "When students from two countries with ongoing border conflicts are invited in the same group, we inform them in advance and make sure they can respect the regulations and try to be friendly and polite," Fang told the Global Times. "But in making arrangements, we ensure they are at a certain distance from each other." Professor Wan Fuming has been researching foreign exchanges and cooperation at the center for decades. His course on International Low Intensity Conflict has become very popular among foreign students. The course is always politically sensitive. "We cannot completely avoid ongoing border conflicts in the class. A military force needs to understand politics, but not in the class. We never present any political stance, but discuss purely on an academic and technical level. If you have any objections, you can raise them at any time during the class," said Wan. 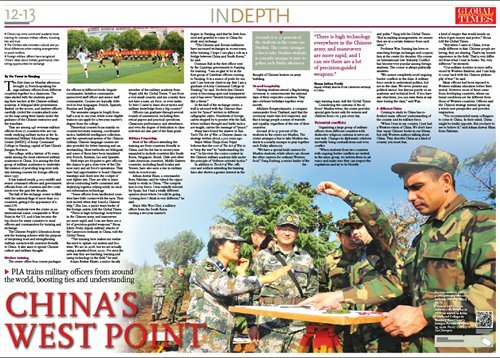 Coming to study in China has refreshed many officers' understanding of the country and its military force. "When I was in my country, I just had a Western vision of China. We don't have that many Chinese books in our library, but only Western authors talking about China. They describe China as a kind of country you must fear, a kind of empire that would invade us when it gets money and power," Etoua told the Global Times. "But when I came to China, it was really different to that. Chinese people are loving, they are sharing. That's my honest experience in the field. That is very different from what I read in books. Yes, very different," he stressed. "Our military doctrine is more influenced by Western thinkers, and I can help to come back with the Chinese philosophy of war," he said. Many officers had been exposed to Western military education before their arrival. However, most of them come from developing countries, whose national conditions are far different from those of Western countries. Officers said the Chinese strategy instead opens up a whole new perspective and provides inspiration. "I've recommended many colleagues to come to China. In their mind, China might be totally opposite. But you have to see to believe it," said Adnan Anwar Khan from Pakistan.